Who will you choose? And if you can, please tell us your favourite member, 2nd favourite, 3rd and 4th member in this group. 1) Arron - This guy is so good-looking! I like his voice and his hair. He's very kawaii, he's my favourite guy in Fahrenheit. 2) Jiro - I like Jiro when I saw the drama, It Started With A Kiss. He's sooo funny in there. He's really cool! 3) Wu Zun - This guy is cute in Tokyo Juliet. But I like his hair short like now, not before this (long hair). So, that's my opinion.. what's yours? PLEASE STATE YOUR REASONS WHY~!!!! Edited by shellstarx., 30 March 2008 - 11:08 PM. jiro! i like his kind of looks. he's so funny in it started with a kiss and cool in zhong ji yi ban. Edited by myaddiction, 30 October 2006 - 03:22 PM. 1. Wuzun.. He's got a great body! Edited by Bleahxx, 30 October 2006 - 06:45 PM. -He's cute, gd-l00king, talented, l0ve his smile too! -He's tall, gd-l00king, has that kind of shy l00k(chi: mian tian)! As for JIRO & CALVIN, i have no preference between the 2 of them. Maybe becoz I still dunno much abt them. HEHEE. Because in ISWAK, im too into Joe Cheng & Ariel Lin.. Oops! And I haven had a chance to watch ZJYB. HAHAA. So yahh, these are my choices! FAHRENHEIT ROX!! Edited by l0vesh0w, 06 November 2006 - 10:27 AM. 1st> ARRON!!!!! sooo cute!!!!! n yea i agree with you ppl bout his smile it's like you'll faint when u see it!!! but i love four of them equally!!! espicially arron!!!! haha what am i talking bout? Edited by bubblegum294, 02 November 2006 - 12:56 PM. 1) Aaron - he can sing the best and he is totally KAWAII and his smile is DAZZLING!!! 2) Wu Zun - saw him in Tokyo Juliet. and thought he is very shy and quiet and also good looking. Arron is my favorite!! he is the best looking guy in this group nice smile and great facial structure. He is really sweet and seems very intelligent. yayh. okay i love fahrenheit. yes i admit their singing isn`t great. but c`mon four really hot guys. haha okay. wow it seems that most ppl put arron as their first. he is tooooo kawaii with his "rainie" haircut and with his short haircut before (like the one of him in 2004 in the picture album section of his blog) he looks HOTTTT!!! he also is a very family-loving person and is the best singer! why? he seems like a really good friend, like whenever someone says something that is awkward for one of his friends he always helps them explain. he is also superSUPERsuper cutee!=) also he is a really good artist. it seems that the only thing bad about him is that he is kind of..... unintellectual....or should i say... dumb. hes cute and shy, but he seems to have a rather bad temper. he talks too much and is a bit arrogant but he is a smart guy. Well.. I dont really like Fahrenheit but I would choose Jiro over those other three. The reason is simply because I have seen him in ISWAK and liked him in there. I never liked Wu Zun and I don't think he's all that hot. Arron is super cute but I don't know anything else about him other than that he looks SO adorable. And Calvin is just Calvin? I know nothing about him either. hehe ALSO ANOTHER fan of FAHRENHEIT..
love their songs..and they are such a cute group..
3. Arron - he is SOOO cute!!!! impossible 4 me 2 choose. but i'll try. 2) arron and wu zun- silent, but still really hot. like arron better tho. hmm...i personally think farenheit singing only okay lah..
my next would be jiro..
2. aaron! !-gosh!hes sooo damn cute!! 4.jiro-not my fav, but he;s funny!! but all!i like this group!love the song them with hebe! !they;re cute n talented too!! 1. Jiro- I loved him after I saw ISWAK. He's so funny and actually good at acting. 2. Wu Zun- I like him and Arron next. But I rarely see anything about Arron. I like how Wu Zun gets roles.. He's not as good an actor as Jiro though. 3. Arron- He's very adorable but I haven't seen much of his stuff other than his singing with Fahrenheit and his super small role in ISWAK. It would be nice to see more of him. 4. Calvin- I've seen very very little of him. No real opinion other than he's my least favorite. 1. JiR0 !=] he is sooo sooo cutee and wos really great wun he acted in iswak (= . 1. Arron! ^^ He's unbelievably cute. Plus, he's the best singer and dancer in Fahrenheit, and he looks sooo good when he smiles! Also, he seems like a really dedicated and smart, and quite filial. 2. Wu Zun! I lovveee his new look, the short haircut, very shuai! I hated his long hair last time, he looked really girly. He seems like a very nice guy too, caring towards his fans, and his love for food is cute. 3. Jiro - I like him as Nakatsu in Hana Kimi...he's okay, but a little too over-the-top sometimes. 4. Calvin - Don't know much about him, except he looks scarily like Zhang Dong Liang from some angles. I don't hate his voice, but I think his vocals are not as good in Fahrenheit. For me it would be Wu Zun first...he's definitely good looking and acting is quite good too. Jiro would probably be #2 because he's quite good in ISWAk and I don't know much about the other two. yeah..i perfer either aaron, wuzun or jiro...especially not calvin..somehow..i just don't like him not in a mean way but i'm not a fan of him...i guess because of how unattractive he seem to me though...no offense for anyone who likes calvin..it is only my opinion cause everyone have their own opinion that they would express lol. Ohh, i agree that their singing isnt that great but who cares man, they're such cuties and have really energetic personalities. 1.] Jiro - cause he seems like a really good friend and someone who is understanding and caring. He seems as if he could cheer up anyone and make me laugh. 2.] Arron - cause he can sing very sweetly and...who am i kidding...he's just so darn cute! 4.] Wu Zun - personally i think he's very bland but maybe thats because he can't speak chinese very well and is embarassed. I don't think he's that cute either =_= sorry guys! I like WuZun and Jiro. This order is very superficial since I don't know much about the group and the people individually other than the drama that I have seen them in. 4. Calvin - last one left. This might change when I learn more about them as a group instead of just here and there like right now. arron - most adorableee out of the group, the BABYY!!! lol. i lov to call him the babii of the group, cuz he is. hhhaaa. when he smiles, totally kills us all and when he doesn't, STILL kills us all. he looks yea... "cold" when he doesn't smile..ooo. akaaa. love that he can play the piano and for a guy, the flute (go him!! !, who says guys cant play the flute). and his singing, vocal wise i suppose is more trained i suppose better than the other 3. i remember where the other 3 were like posin "cool" and him doing the bunny rabbit thing... it was so funny. so cute... then when they had to say HAHAHHAAA outloud... he did his really loud *gahh*, then chun jux teased him there and said HAHAAAA in a veryy high pitch like voice which made arron laughed till he dropped. kakaaa. wuzun - got the gorgeous features. he is the best looking (in my opinion wise) and of course goshh best body too. lol . can't lie. he is shy but he is funny at times... can be. he is the mature one out of the group... haha, each one have their ROLES. him being the father. lol. he loves to eat!!!! and he can cook well.. awesome. ahaahaaa. for a guy with good body, but crazzyyy about food. his voice is actually different from the 3.. more i guess unique i should say. though he just needs to work more on it. HIS ACTING SKILL AINT BAD FOR A NEWBIEE. i mean, he already got the main male role for his first drama and he wasn't bad in his acting. i was really impressed. seriously. ahem, tattoo.. wootwoot? lol. we all wonder but i'm sure he has his reasons. i also find him.. thoughtful at times too. ME WANNA PINCH HIS CHEEKS. WOAHHHH i said enough. said too much. sorryyy. lolll. i like all of em. cos he's veri funni and the main reason is...(drums rolling...) he can be cute and yet shuai at the same time! he also seems veri caring... whenever someone in fahrenheit breaks down, he would always seen comforting the person. his eyes are...i dunno... they just seem to attract me to them.... haha. his eyes are really nice and he seems veri nice as well. oso the youngest of the four so he tends to behave like a little child every now and then. whenever tat happens, i just want to yell kawaii! lol. he's handsome but really really quiet. but kinda like him cos... actually i'm not too sure why though... lol. I saw him on a few talk shows and I found him reli likeable already! I've always loved guys who are mysterious but cute/sweet on the inside. He can play the flute!!!! I play the flute too!!! ^^"
Arron: 12 people choose him as their most favourite, 6 people choose him as their 2nd favourite, 4 as 3rd favourite, none for the least favourite. Calvin: None for most favourite and 2nd favourite, 2 as 3rd favourite, 15 as least favourite. Jiro: 10 as their most favourite, 8 as 2nd favourite, 4 as 3rd favourite, 1 as least favourite. Wu Zun: 4 as most favourite, 7 as 2nd favourite, 6 as 3rd favourite, none as the least favourite. Some people who don't know which one to choose are not counted. Continue to choose your favourite! his so cute.shuai.muscular.and i love his voice! lyk him ever since i saw him in ISWAK and KO one. they are both super duper handsome. i love thier eyes. so mi ren. hahas. 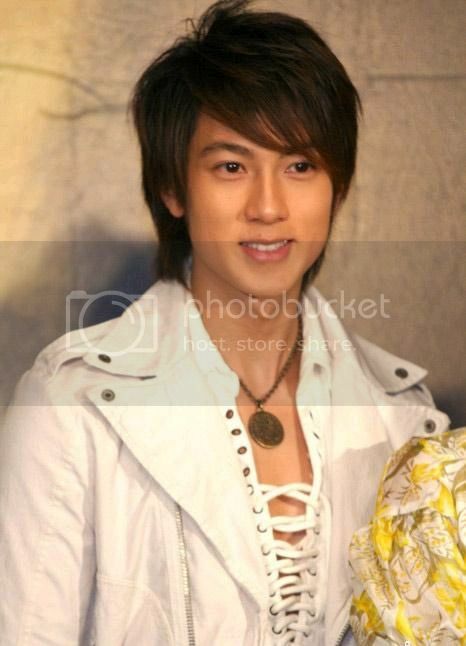 wu chun's acting in hana kimi is so good. I Love Jiro the most! he tends to be very cute even juz in small scenes. his attitude too is really interesting and his actng always satisfies and contents me. and he never seize to amaze me. but in all in all i like Wu Zun's face. they're all gud looking but i like his face the mozt. I loveeeee Wu Zun.... Hah. Love his personality, his craziness for food but yet at the same time, maintain the healthy image, love his awkwardness whenever he make a mistake in his language, hah. Love his straightforwardness... Hah. Oh man. I'm going crazy. Help. Everything is just Chun, Chun, and Chun. Arron!!!!! He really looks really babyish. Hah. Can be compared to Rainie alr. Very innocent in all, has nice eyes. His personality shines quite a bit and oh wells. I dunno how to put it. I just like him. Jiro!! Hah. As for him, i didn't really start going wow over him in ISWAK. But i started going wow on him in Hana Kimi. Hah. His personality seems great too. Calvin! Hah. He seems intelligent. Really intelligent and i think among the 4 of them, he speaks the best too... The best brain, should i say, and i think the other 3 members of Fahrenheit agrees with this too! Arron , Jiro, Wu Zun, then Calvin . & then so is Jiro . Wu Zun doesnt really appeal to me , but he's okay la . Calvin is just blah . 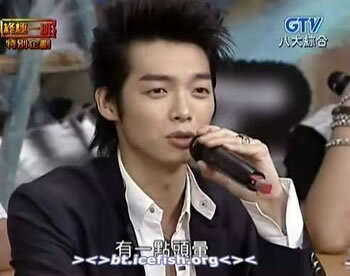 1) Wu Zun - Hot!, considerate of other people and his shyness is really attractive. 2) Jiro - caring, funny, out going and really talented in art. 3) Arron - cute like a child. 4) Calvin - sorry but haven't noticed anything special about him yet. WAHHH~!! This is so hard! Going to rate this four handsome boys?? 1. Aaron - He's the youngest and the one that could sing most. - He can also play the piano! 2. Wu Zun - Didn't actually like him at first even when I was watching TokYo Juliet I can't feel him but after watching episode 1 of Hana Kimi....It's ova! I loved him!! 3. Jiro & Calvin - Is it me or Calvin and Nicholas Zhang Dong Liang look alike? He's super good-looking and he's got that rock style in him which I'm very attracted to. He owns a cute smile and personality. I love the way he jokes around and talks a lot, it shows that he's a very approachable person. Plus, I love the way he dresses! Everytime I see him, he's always got some really nice clothes on. Oh! Another major reason is... HE CAN PLAY GUITAR!!! I've always had this thing for guys who could play guitar He's acting is really cute as well. He's got a generous smile and he can sing pretty well. I love his eyes! They're so attractive. He can play the flute! If I haven't got my facts wrong, he came from Australia which is where I come from!!!! That's not a reason to like him but that's a reason to feel more of a connection. I love his body! It's so built up and he's really good looking in his coming series, the one with Ella~ I forgot the name! I really started to like him when he was in S.H.E's Zhe Me Ban video clip! So cute! Wu Zun didn't come from Australia, he came from Brunei. Edited by devil_rainiemike, 02 December 2006 - 08:10 AM. Ok, loved him since TJ... and more since his hair cut!! I gave him extra points because he studied in aus =D good boy for choosing aus man!! He can COOK!!! Man i love guys who can cook, he is funni too!! He is so much more talkative now so... yup!! I like guys who can talk!!! lol, he has such a nice smile and realli nice eyes. i just love guys with nice eyes. he is brainy too!! i like brainy guys too, he is smart, cute and yeah.. not always the best bod but hey.. don't care... i like talkative ppl! plus he makes me laugh like crazy because he is so cute... good stomach exercises haha!! the rubbing eye thing is ADORABLE.... hell he is soo cute! great dancer.. hope his foot archillies tendon? will be better soon... heaps of rest will do him good..hope he bandages his foot when he puts weight on it! i dunno, he is just... too talkative and realli weird for some shows.. i literally can't stand his hand movements....sorri but he is just... i dunno, because i never realli liked the character ah jing due 2 my obsession with zhi shu aka joe... so he never realli hit... i mite change after watching a few more shows.. but he isn't daaat bad!!! 2nd: Aaron, he very mesmerising... and quite cute aye.